IF love endures you can find it in two plain benches that stand side by side in a leafy square in Bloomsbury. Both lie under the shade of a cherry tree planted 40 years ago to commemorate the day the atom bomb was dropped on Hiroshima. A strange place you might say to discover love but there I found it on Saturday when dozens of relatives and friends gathered to remember the life of Jack Gaster and his wife Moira. Jack was a solicitor whose courtroom battles for the underdog over the decades turned his life into a legend among lawyers and trade unionists. Jack, who lived in Belsize Park with Moira, died earlier this year at the age of 99. And because he would have been 100 on Saturday, his family unveiled a bench in his honour – a few feet away from one dedicated to Moira following her death in 1990. 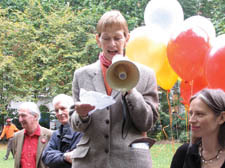 It was Moira, passionate about nuclear disarmament, who had inspired the then Camden council leader Millie Miller in 1967, to plant the cherry tree in Tavistock Square. The Gaster’s marriage spanned 51 years, a union of deep affection and shared political ideas. Their daughter Polly, who flew in from her home in Mozambique for the ceremony, stood on the bench and, gripping a loudspeaker, reco­u­nted her father’s love of his wife and children as well as his passion for socialist causes and literature and music. His death broke the last link with a long line of literary figures such as HG Wells, AP Herbert and the poet Louis MacNeice who used to drop into their Hampstead home. After both benches were ‘anointed’ with champagne the crowd sang verses from the ballad, I’m the man, the very fat man who waters the workers’ beer, and a Spanish civil war song. As the crowd made their way to a reception at the nearby British Medical Association, I glanced back at the benches. The lives of Jack and Moira had spanned the last century and I wondered what was the secret that had bound them together for so long. A smile like your auntie, but not quite a pushover! I IMAGINED the scene as I walked down Highgate Hill on Tuesday evening: A prisoner sits disconsolately in his cell when he hears the jangling sound of keys and the door suddenly swings open to reveal a demure smiling middle-aged woman. Moments before I had met this woman, Anne Owers – and that’s her job, to inspect Her Majesty’s Prisons. She had given a talk on prisons to a packed audience at the Highgate Literary and Scientific Institution. But it wasn’t so much what she said but the manner in which she said it. While peeling off grim statistics, she smiled a lot, looking like everyone’s auntie. Prison figures are overwhelming – more than 80,000 men and woman inside our jails, one of the highest figures in Europe, a rising number of suicides among young men and women, more women cutting and disfiguring themselves (Ms Owers had discovered one woman who had forced a Biro pen into her veins). In recent years I have visited jails in London to interview inmates and found them left-overs from the dark Victorian times. There were gulags in the Soviet Union. They are our gulags today. Ms Owers smiled, aware, perhaps, of the hidden lives in jails. How did she see prisoners, I asked her? At random? If so, with warders by her side? “No, I go straight into cells, unannounced, because I am given a key,” she told me. Her picture of our prisons wasn’t completely black – there were plusses, too. Staffing was better though six weeks training for the job wasn’t enough. Only six weeks! The audience gasped! But coming government cuts worried her. I sensed she felt a disaster was brewing in the bulging prisons. Before her appointment, she had already gained recognition as a woman with radical ideas – she helped to run the human rights body, Justice. But had those who picked her for the job five years ago confounded her smiling, relaxed middle-class manner with a compliant push-over for government policies. If so, they had got it wrong. I warmed even more to her when I learned after the meeting from the society’s chairman Trevor Grove that she wasn’t going by taxi to her south London home but by tube. “I wouldn’t like to travel by tube at this time of the evening”, he told me. But Ms Owers, I bet, is as tough as old boots. I DON'T consider myself a master of economics and statistics but I got it right in this column last week when I recognised the Tories were onto a winner by promising to kill-off inheritance tax – even though pundits lined up on TV to knock the idea. Among them were New Labour luvvies, but that was to be expected. I dismissed their argument that only six per cent of property owners would benefit by pointing out that that may be accurate as a median figure but that, in most leafy streets in the south east, most households would benefit from a £1m ceiling. In short, millions would benefit. Hence, chancellor Alistair Darling stole the idea on Tuesday. Moral: Try to avoid getting suckered in by experts and pundits. BOB Hall, who has died, was old Labour and an old style councillor – in many ways an anomalous figure in today’s political world. He didn’t mind taking a bit of the limelight at times but that wasn’t why he was drawn to Labour politics. I got to know him in my days when I used to cover the Town Hall and I always felt he had a sense of duty in a way that some today would consider a bit old-fashioned. Too many councillors today cast an eye on higher positions. Over the years many Camden councillors, most of them Labourites, have drifted off to the Commons or high offices in the charity industry. It was inevitable, for instance, that when the smart boys in the higher Labour echelons decided to close down several libraries six years ago, Bob would join the rebels without a moment’s thought. To Bob, principles remained principles. As I said, he was just old-fashioned.